If you want a bumper crop of asparagus perhaps you should consider planting asparagus companion plants. Asparagus plant companions are plants that have a symbiotic relationship, one that is mutually beneficial to each. In the following article, we will discuss the benefits of companion planting with asparagus and what grows well with asparagus. Companions for asparagus or any other vegetable must be compatible with each other. Asparagus is a perennial that likes a sunny area of the garden. They take 2-3 years to reach a full yield and, thereafter, produce spears for the next 10-15 years! This means that companions for asparagus must like sun exposure and be able to work around the semi-permanent asparagus. Companions for asparagus may be those that add nutrients to the soil, deter pests and disease, harbor beneficial insects, or aid in water retention or weed retardation. What Grows Well with Asparagus? Asparagus companion plants may be other veggie plants, herbs or flowering plants. Asparagus gets along with many other plants, but tomatoes are notorious for being excellent asparagus plant companions. Tomatoes emit solanine, a chemical that repels asparagus beetles. In turn, asparagus gives off a chemical that deters nematodes. Interplanting parsley and basil, along with the tomatoes, in close proximity to asparagus is also said to repel asparagus beetle. Plant the parsley and basil underneath the asparagus and the tomatoes alongside the asparagus. The bonus is that the herbs help the tomatoes grow better. In this particular companion planting quartet, everyone is a winner. Other herbs that enjoy asparagus’ company include comfrey, coriander and dill. They repel insect pests like aphids, spider mites and other detrimental insects. Early crops such as beets, lettuce and spinach can be planted between the asparagus rows in the spring. 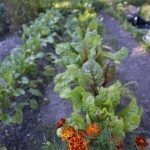 Then in the summer, plant a second crop of lettuce or spinach. The taller asparagus fronds will give these cool weather greens much needed shade from the sun. During Colonial times, grapes were trellised between asparagus rows. Flowers that coexist well with asparagus include marigolds, nasturtiums and members of the Aster family. 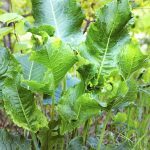 The most interesting combination of companion plants for asparagus that I have read about was asparagus, strawberries, rhubarb and horseradish. This sounds like the makings of a fabulous dinner. Garlic and onions can be offensive to some people, and for those of you who abhor these crops, asparagus agrees with you. Keep them well away from asparagus in the garden. Potatoes are yet another no-no. Cross check and be sure that all the asparagus companion plants are friendly with each other prior to planting, as some plants simply do not like one another.